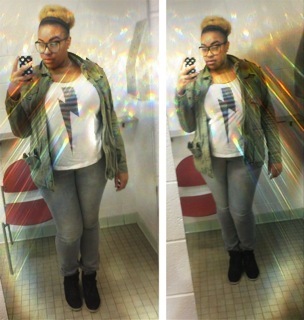 Ok so if you follow me on instagram, you know every so oftern I post pictures of my OOTD. I should get more into a routine of what I wear on a daily basis, but my daily schedule gets so hectic that I can barely snap a photo! Lately however I have become quite the bathroom model, and have been snapping pictures of my outfits inbetween classes and work. I mean when you have an amazing outfit, you gotta do what you gotta do! So with these particular outfits I just had to snap because I loved it them that much much. So lets begin with the first outfit, which is my ABSOLOUTE FAVEEE of this past week. I am an avid lover of all things animal print, so when I got this cheetah print vest for christmas last year, I squealed with joy! Sadly tho, this is my FIRST time wearing this vest and I’ve had it for 2 years. *slaps self on forehead* So I knew that on this day I had to break out my vest befor the winter weather my vest stuck in storage for another year. 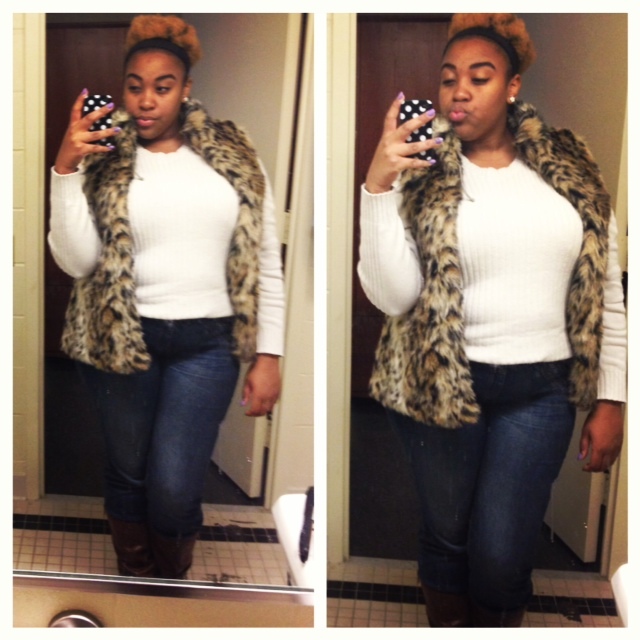 This fabulous cheetah vest is from Aveneue, gifted to me on christmas by my even fabulous momma. 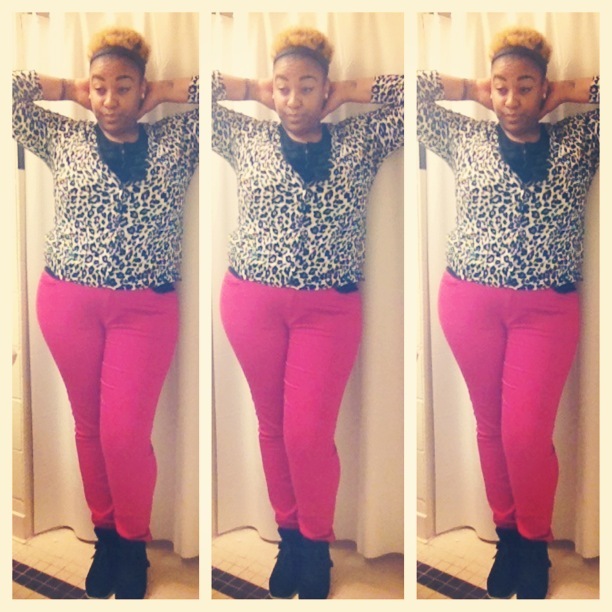 The jeans are from Ny&Co that I got for christmas this past year. The oversized cream sweater I stole from my brother. (Shhhh dont tell him) And the boots which you cant see in the pic are tall chocolate brown boots from Lane Bryant. I showed them in my winter shoes edition video a year or go.Click Here if you want to check it out. If you know me personally you know that I have an unhealthy obbsession with Harry Potter! So when I saw this thunder bolt tee from Forever21 years ago, the innder muggle in me just squaled with delight! I was going for a causal boy-ish look, so I paired this tee with my grey skinny’s from Ny&co, my green jacket that I also stole from my brother. (once again dont tell him!) 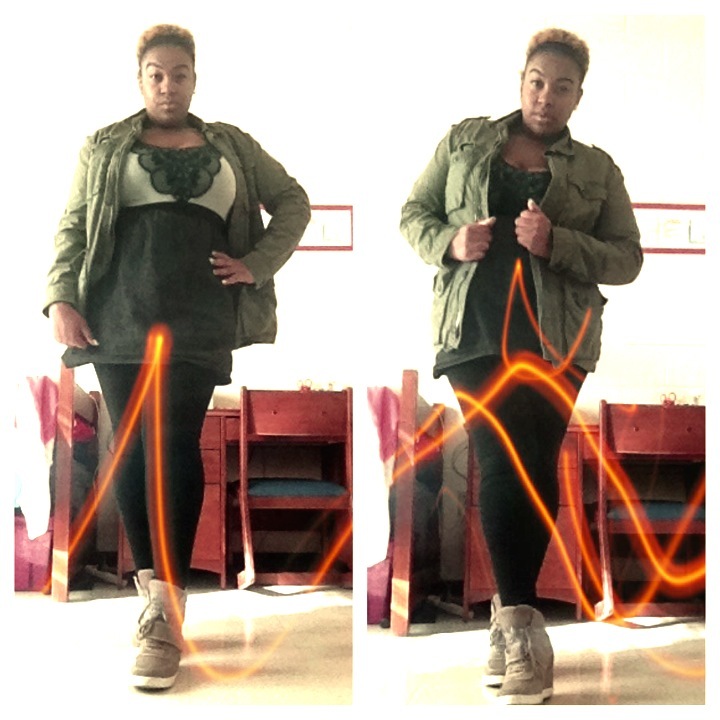 and my sneaker wedges which you will see in the next couple of outfits, that Im currently obbsessed with. ok so this look I was trying my hand at some color blocking and I think I pretty much hit the nail! 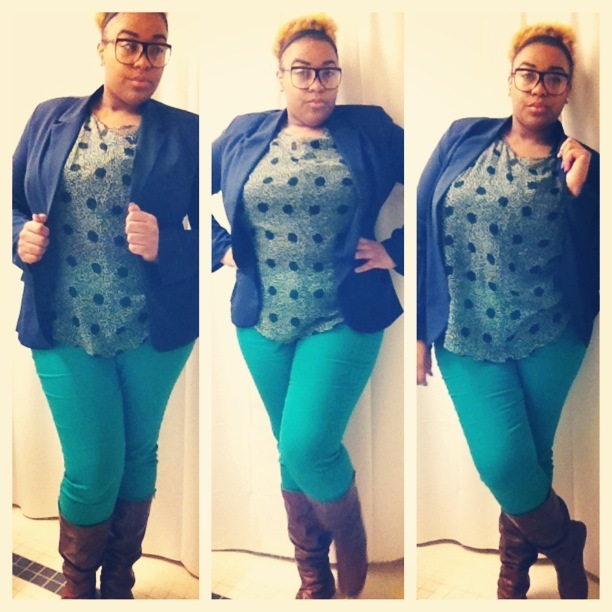 I got thease lovely green skinny’sfrom Ashley Stewart, Pecock printed top from Burlington Coat Factory, the blazer from Forever21, and the boots are the same from the growl power look above!. I went to a poetry event in this outfit, and honey I knew I looked good! Ok so just like any other mean girl’s fanatic, I had to take advantage that not only did I wear pink pants, but I wore them on a WEDNESDAY!! It just was the perfect timing and honetly the best caption that I ever thought of!. I got the pink pants from Forever21, the cheetah printed cardi from target, the black shirt under it from K&G, and threw on my handy dandy sneaker wedges. 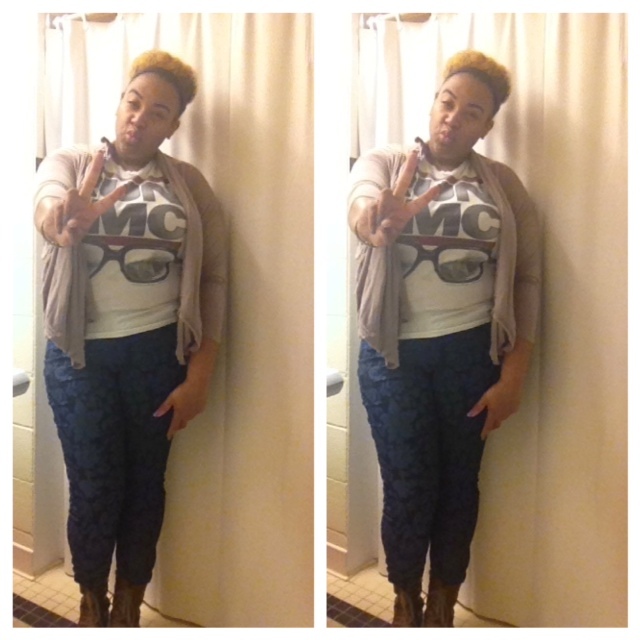 I was going for a more cool and laid back look on this day, so I decided to pull out my handy dandy Run DMC t shirt from Target, my floral printed skinny’s from Ashley Stewart, Convertable Cardigan from Sonsi, and my brown boots from Lane Bryant. Ok so with this look, I wanted to wear a dress but I wanted to not look so girly. So I threw on that green jacket I stole from my brother, with this girly dress I got from Fashion 2 Figure, my black leggings from Forever21 since it was cold out, and my light brown sneaker wedges from Nine West. My version of being a tomboy. Ok so I saved the best outfit for last! I was definitively feeling bold and edgy this morning! I took one look at these printed leggings from Torrid and the outfit just started coming together. I got the white button up from Target, the studded belt from Forever21, the tutu which is actually a dress from Fashion to figure, and my good ol handy dandy black sneaker wedges. 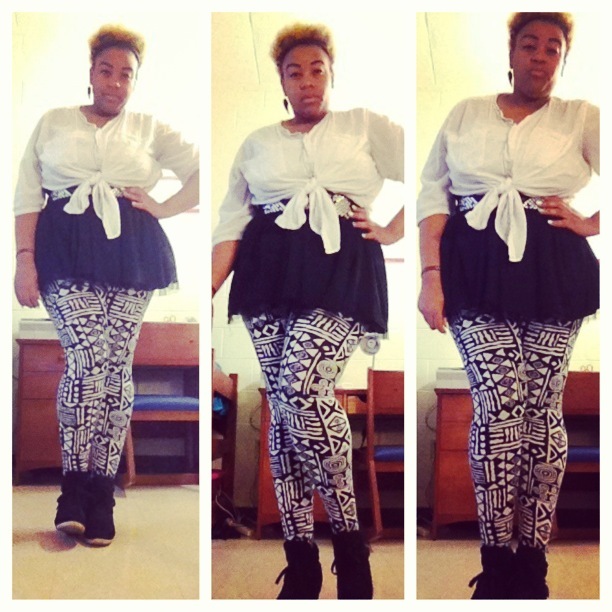 This outfit was def a hit, and I felt very confident and bold alll day!